Pencloddiau Circular Trail at Moel Famau / Clwydian Range (NRW)0300 065 3000work Walking RouteCoed Llangwyfan Forest rises very steeply from the stream at its base and up on to the summit slopes of the Clwydian Hill near Penycloddiau. There are three walks that start from here; two go to hillforts and all three offer great views. There is also a bridleway that runs through the woodland which is popular with horse riders and cyclists. The Offa's Dyke long distance path passes across the top of Coed Llangwyfan Woodland. Coed Llangwyfan Forest rises very steeply from the stream at its base and up on to the summit slopes of the Clwydian Hill near Penycloddiau. 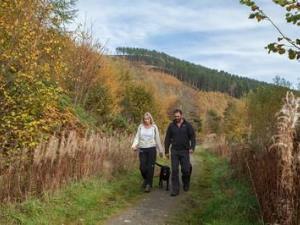 The Penycloddiau Circular Trail is a walk through the forest with a gradual climb to the open summit of Penycloddiau and its giant Iron Age hillfort and spectacular views. The return route goes around the lower ramparts. Coed Llangwyfan is four miles east of Denbigh. From the roundabout on the A525 south of Denbigh, follow the minor road signposted to Llanddyrnog. Go straight on at the next roundabout across the B5429. Turn left at the next junction and follow this road to the top of the hill and Coed Llangwyfan car park is on the left. The OS grid reference is SJ 138 667.